UN Secretary-General Kofi Annan has termed the US-led invasion of Iraq “illegal”, as it contravened the world body’s Charter, and said he feared “credible” elections in that country as planned were unlikely to take place given the present security scenario. “A mighty soul” was how the “missile man” President A.P.J Abdul Kalam described national liberation struggle icon and former South African President Nelson Mandela in the first meeting between the two leaders here today. A rain-swollen river in Bangladesh has burst its banks, sending torrents of water through more than 100 villages south-east of the capital and leaving thousands of people homeless, officials said today. Rickshaw-pullers wade through a flooded street in Dhaka on Thursday. At least 26 persons have died in the latest downpours. T HE SURPRISE arrival of five protesters in the House of Commons marks the most recent of a string of security breaches at Westminster. Despite heightened security since the WTC terror attacks, it marked the third occasion this year that protesters have managed to bypass the Parliament security with apparent ease. A senior U.S. official on Wednesday said the Bush Administration did not believe the then Atal Bihari Vajpayee government was involved in inciting communal riots in Gujarat in 2002. “We don’t believe the Central Government, even under the BJP government, was involved in inciting those riots,” said Mr John Hanford, ambassador-at-large for International Religious Freedom. He was speaking at the release of the State Department’s International Religious Freedom Report for 2004. The riots in Gujarat in February and March of 2002 that targeted Muslims, left around 2,000 persons dead and displaced 100,000 others into refugee camps. Human Rights groups had suggested that the BJP-led Central Government’s inadequate response to acts of violence against religious minorities was due at least in part to links with extremist groups. Meanwhile, at the White House, President George W. Bush told India’s Ambassador to the United States he was looking forward to meeting Mr Singh in New York on the sidelines of the United Nations General Assembly next week. Ambassador Ronen Sen presented his credentials to Mr Bush at a brief Oval Office ceremony. Mr Bush told Mr Sen his Administration shared India’s goal of working together to make the “strategic partnership” broader and deeper. Yesterday, Washington chastised one of its close allies in the war on terror. The State Department report put Saudi Arabia on a blacklist of violators noting “freedom of religion does not exist” in the oil-rich kingdom. On India the report noted that the status of religious freedom had “improved in a number of ways.” There were “no new anti-conversion laws” during the period covered by the report and Tamil Nadu announced its decision to repeal its anti-conversion law. During most of the period covered by the report, the Central Government was led by the National Democratic Alliance (NDA). “The leading party in the coalition was the Bharatiya Janata Party (BJP), a Hindu nationalist party with links to Hindu extremist groups that have been implicated in violent acts against Christians and Muslims,” the report said. “I’ve indicated that it was not in conformity with the UN Charter from our point of view, and from the Charter point of view it was illegal,” Mr Annan told the BBC World Service yesterday when asked whether he thought the war was legal. With less than four months left for the elections in Iraq, which are scheduled to take place in January, 2005, Mr Annan warned that there could not be “credible elections in the security conditions as they are now”. The UN would give advice and assistance to the Iraqi interim government in the run-up to the poll, he said, adding but it was up to the administration to decide whether elections should take place in such an atmosphere. Annan’s comments, which came amid a spurt in violence in Iraq against US-led forces and civilians supporting the interim administration, were likely to bring to the fore again the debate over the legality of the invasion in March, 2003 to overthrow President Saddam Hussein. The Secretary-General’s statements also came ahead of the UN General Assembly’s annual session next week, where heads of all member countries are likely to converge. Meanwhile, a British foreign office spokesperson told the BBC that the Attorney-General had made the government’s position clear about the legality of the military action in Iraq at the time of the war. “The Attorney-General made the government’s position on the legal basis for the use of military force in Iraq clear at the time,” a UK foreign office spokeswoman said. Dr Kalam, who is on a four-day visit to South Africa, posed before journalists shaking hands with Mandela. They walked to the conference hall holding each other’s hand. The 86-year-old South African leader took the support of a stick with the help of his other hand to walk from the room where he had a 15-minute one-to-one meeting with Dr Kalam. The two leaders emerged from the meeting, once again holding each other’s hand, to jointly answer volley of queries from the waiting mediapersons. Asked how he felt on the Indian President’s visit, Mr Mandela said he had met Indian leaders earlier also and added he had visited India thrice. “It is not the first time that a highly placed person from India is visiting,” he quipped. Mandela recalled India’s contribution to the freedom movement in South Africa. They said the sudden collapse of about 100 m (330 ft) of the Gumti river embankment late on Wednesday inundated thousands of houses. No deaths or injuries had been reported, said an official in a nearby Comilla town, 150 km (100 miles) from Dhaka. Bangladeshis are still reeling from the country’s worst floods in 15 years in July, which killed more than 700 persons and left around 10 million homeless. The heaviest rainfall in more than half a century over the past week has put large parts of the country, including Dhaka, under 3 to 4 ft (0.9 to 1.2m) of water. The rain eased on Wednesday but weather officials said there could be intermittent showers over the next two days. THE SURPRISE arrival of five protesters in the House of Commons marks the most recent of a string of security breaches at Westminster. Despite heightened security since the WTC terror attacks, it marked the third occasion this year that protesters have managed to bypass the Parliament security with apparent ease. It was on May 19 that two campaigners from the Fathers 4 Justice sparked fears that the House of Commons was under biological attack after hurling purple flour and glitter-filled condoms. Prime Minister Tony Blair was hit in the back with one of the two condoms during a heated exchange with Michael Howard, Conservative leader. The latest infiltration coincided with the conviction of one of the campaigners Ron Davis, 48, who was given two-year conditional discharge for disorderly behaviour. 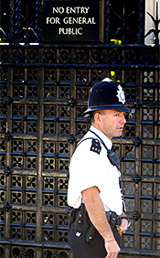 The incident took place only weeks after the Commons introduced a glass security screen in front of the public gallery to prevent such an attack. However, the two protesters had been seated in special seats reserved for MPs’ guests in front of the screen, which had been auctioned for charity by Lady Golding, a former Labour MP, who later apologised to the Lords. The incident prompted immediate calls for further measures to tighten security at Parliament amid a climate of fear of terrorist attacks and suicide bombers. In March, two Greenpeace activists caused a scare after breaching security to scale Big Ben as part of a six-hour anti-war protest. The previous month, seven activists from Judges of Justice again forced the House of Commons to be suspended at the start of a debate on the Hutton report. They were staging a protest against the appointment of Lord Butler to chair a review of intelligence on Iraq’s WMD. Other notable occasions of security breaches in Parliament during the pre-September 11 period included the 1988 incident in which militant lesbians abseiled from the public gallery in the House of Lords. The women were demonstrating against Section 28, which bans “promotion” of homosexuality. It was in 1970 that two CS gas canisters were thrown into the Commons chamber, forcing widespread panic and evacuation. At the time of the attack, one person shouted: “Now you know what it’s like in Belfast.” — By arrangement with the Independent, London. PARIS: A Canadian inventor has devised the world’s first computer to be controlled by the nose and eyelids which can be a boon for people with disabilities, New Scientist reports. The nose-steered mouse, called a “nouse”, works by using tracking software linked to a webcam that identifies a group of 25 pixels which are the tip of the nose. Motion detection software is used to spot the blink of the user’s eye.